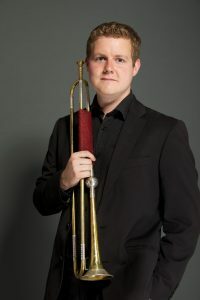 “We’re looking forward to welcoming trombonist Matthew Gee back to the Southwell Music Festival. I’m Matthew and based in Ealing in West London. 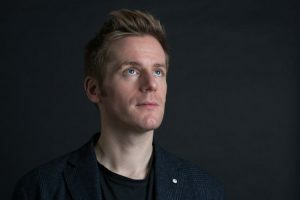 My main job is to play principal trombone with the Royal Philharmonic Orchestra, but I also hold positions with the Aurora Orchestra, Septura Brass Septet and teach at the Royal Academy of Music in London. I enjoy getting out from the back of the orchestra and playing solos, and quite often travel to festivals to take masterclasses and perform recitals. I have just returned from a fantastic festival in Lieksa, which is in North-East Finland, not too far from the Russian border. Plenty of sauna and lake swimming that week! Well I’ve never played the Tippet, so I’m looking forward to that on Saturday night, especially as the trombones get to sit directly in front of the Southwell Voices, who are one of the best choirs I get to work with. And the Berio. It was written over fifty years ago, and is still one of the most challenging, entertaining pieces in the repertoire…as long as you’re not scared of clowns! I’ve just finished recording the whole of Schubert’s ‘Winterreise’ for trombone and piano. This will be coming out on the NAXOS label at some point in the next year, so I’ve plenty of follow-up work to do on that project. We’ve also got some great touring with Septura – New Zealand and Japan – so that’s very exciting. This year has been one of the busiest I can remember, and I’m expecting to become a dad in early September, so the trombone is going in its case for three weeks while I have a well earned rest, and probably no sleep! “We’re looking forward to welcoming flautist Charlotte Ashton back to the Southwell Music Festival. My name is Charlotte Ashton and I am the Principal Flute of the BBC Scottish Symphony Orchestra. As of about 18 months ago, I now live up in Glasgow (where the orchestra is based) in my flat in the West End. 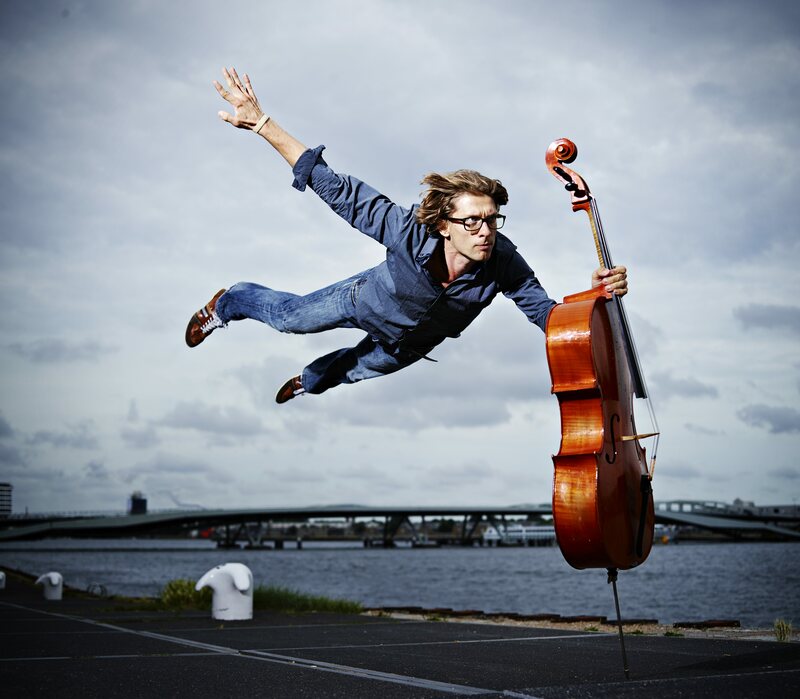 In addition to my position with the orchestra, I also perform as a Guest Principal with other orchestras, and try to do as much solo performance and chamber music as possible. Any free time I have, I spend doing DIY on my flat. My most recent project was building, painting and upholstering a footstool! I am so excited about coming to Southwell this year – the inspiring and encouraging atmosphere really is something unique. In particular, though, I am looking forward to playing Mozart’s Flute Quartet in D, as this is my favourite of his flute quartets, and it is always exciting to learn this with a different group of string players. The second movement of the piece is one of the first things I ever performed with orchestra when I was younger, and it is such a desperately sad, yet extremely restrained and poised, melody. I love the challenges of working in a string quartet formation, like knowing when and how to blend with the sound as opposed to when to sing out as the soloist. I’m especially excited about doing the repeat concerts, because it’s such a treat to walk off stage having enjoyed yourself but know that you get to do it all again! When I leave Southwell, I’ll be going back to work in Glasgow, and our first concert is one of the chillier concerts of our schedule up in Scotland – Proms in the Park, which is held outside in Glasgow Green! We have a great season of concerts coming up, including a really exciting project in Glasgow Cathedral and some fantastic programmes with lots of exciting flute parts to look forward to. I’m also fortunate to be involved with a Hebrides Ensemble project at the Lammermuir Festival in September, which includes Ravel’s Introduction and Allegro, and Debussy’s Trio for Flute, Harp and Viola. 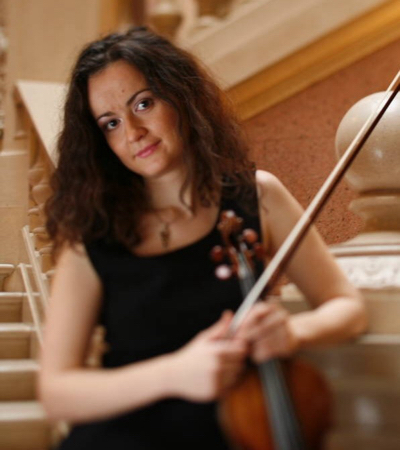 “We’re looking forward to welcoming violinist Maria Spengler to the Southwell Music Festival for the first time. My name is Maria Spengler, I come from Belgrade and I’m a violinist. For the last 20 years I call London my home, where I live with my husband and my 8 year old daughter Sara. I divide my time between a teaching post at the Belgrade Academy of Music and chamber orchestras such as Aurora Orchestra, English Chamber Orchestra and BandArt Orchestra, based in Madrid. If I had to choose one piece from the entire program, my favourite would be Bartok’s Divertimento for string orchestra. 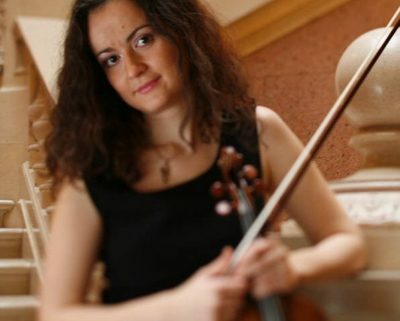 I was very fortunate to get to know the string orchestra repertoire very early on in my professional life, while still a student in Belgrade, through my first engagement as a leader with a string orchestra St George Strings. Divertimento is where Mozart and Corelli meet the folk music from Balkans, through eyes of Bartok, it echos with nostalgia for me. It will also be great to revisit Mendelssohn’s master piece for string octet, real treat for every string player. At the moment I am on a little break between concerts on a tour with Aurora Orchestra performing Beethoven’s 5th Symphony from memory. After that the next interesting project will be in Spain, with the BandArt orchestra where we will be playing a series of concerts, including Mahler’s 9th Symphony. At the end of the year I will be going back to Bach Solo Sonatas, as a follow up to my PhD in Music, that I did at the University of Arts in Belgrade. “We’re looking forward to welcoming trumpeter Russell Gilmour to the Southwell Music Festival for the first time. My name is Russell Gilmour. I’m originally from the Isle of Man and I’m now based in the UK but tend to travel a lot for the music I play. 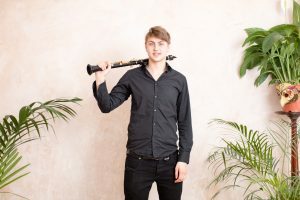 I specialise in performing on early brass instruments – specifically the natural trumpet (otherwise known as the baroque trumpet) and I also play the Renaissance Cornetto. I will be playing first trumpet in Bach’s B Minor Mass on Wednesday 22nd August 2018 in Southwell. I’m particularly looking forward to the performance because we are using a small (but perfectly formed) orchestra and choir. I can imagine the musicians of Bach’s era huddling around a few music stands in the small galleries at the back of Bach’s churches and I think this scale of performance will be in keeping. I think this will make for an intimate performance at Southwell and it will sound great in the acoustic. From the natural trumpet section’s point of view we will be playing as considerately as possible to compliment the small orchestra, and the trumpets will be playing in the ‘clarino’ (high) register which will (we hope) demonstrate our most refined delicacy! Bach’s trumpet parts are famous for being challenging, ingenious and rewarding (and at times mystifying), and I simply love playing them and I learn more about them all the time. After playing in Southwell, I’m going to Utrecht in Holland to perform Delalande’s Te Deum with a Belgian group and immediately after that I will be joining a British group for a performance of Monteverdi’s Orfeo in Antwerp. Beyond that there’s some hand engraving to be done (I engrave garlands that eventually end up on natural trumpets) and later in the year I’m looking forward to playing Handel’s Water Music on a tour with a British period instrument orchestra in Brunei, Thailand, Laos, Cambodia, Philippines, Malaysia and Vietnam. “We’re looking forward to welcoming soprano Zoë Brookshaw back to the Southwell Music Festival. My name is Zoë Brookshaw and I’m based in Loughton, near Epping Forest on the outskirts of London. 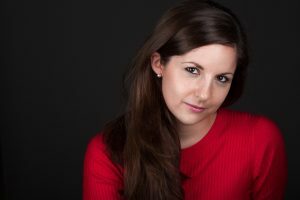 I’m a soprano and am completely freelance, which is great because it means that the work I do can be really varied. I sing in the choir at the Tower of London every Sunday and with lots of other professional choirs based in London like the Monteverdi Choir and The Sixteen. The other side of my career is as a consort singer and soloist. Probably some of my favourite work is with a group called Solomon’s Knot, which is a chamber ensemble performing mostly baroque oratorio. We perform big oratorios like Bach’s John Passion or Handel’s Messiah with one or two musicians to a part sharing out the solos amongst us. The really exciting bit though is that the singers perform entirely from memory and we have no conductor… so there’s really no one to save you if you forget the music!! The idea behind this is to remove all the potential barriers between performers and audience creating a more immediate experience for the audience. Small ensemble work like this is probably my favourite thing to do as it’s truly challenging and it also combines my love of singing both as a soloist and in an ensemble. I’m most looking forward to singing the Bach B Minor this year in Southwell. It’s one of my favourite choral works of all time as I think the emotional ark of the music is just incredible. There are some really joyous (and complex) movements like the ‘Pleni sunt coeli’, the ‘Gloria’ or the ‘Osanna’, and also some really anguished moments like the ‘crucifixus’. I’m always exhausted by the end but I love it! I’m also really looking forward to getting to know ‘Child of our Time’ as I’ve never performed this piece in its entirety, but the bits I have done are awesome so I’m excited to discover what the rest of it is like…! In the next few months I’m doing ‘Theodora’ in the Proms with a group called Arcangelo, a big European tour of Verdi’s ‘Requiem’ with the Monteverdi Choir and I’m also performing Bach’s ‘Magnificat’ with violinist Rachel Podger in the Brecon Baroque Festival in Wales.